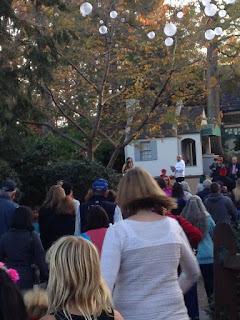 We were so excited to be invited to visit Bush Gardens Williamsburg for their Christmas Town festivities! We were offered opening day tickets- which ended up being very well attended. It was Friday, November 27, which was also my eldest son’s 12th birthday, so we were excited to spend his special day at the park! Pictures of my birthday boy! Driving down was a bit of an adventure because our GPS program decided we needed to do a scenic detour around William and Mary. It was also the day after Thanksgiving so we sat in a little traffic. Be ye not so dumb and don’t go on an awful traffic day. We printed our tickets out before we arrived, which ended up being a HUGE timesaver. We got to skip the will-call and purchase lines and go straight to the gates. 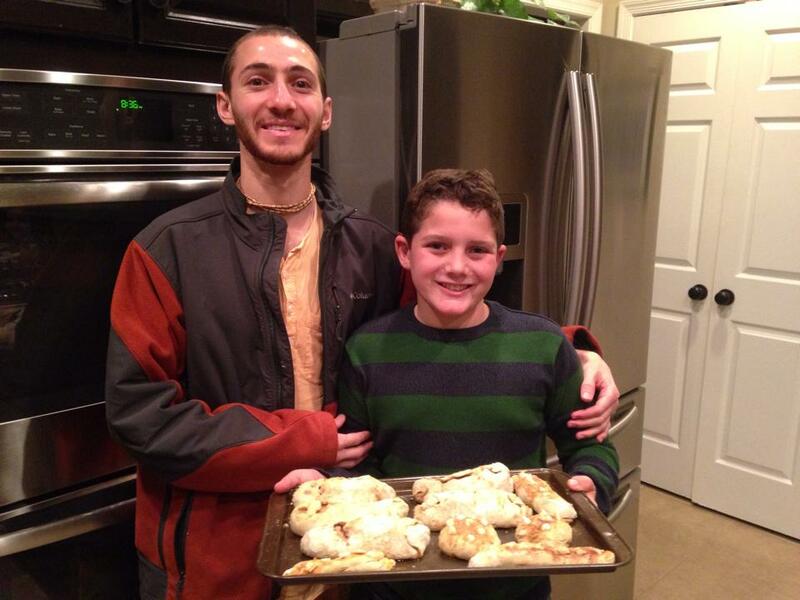 Note that there is a bag check involved in the process. We did bring backpacks, though, because while we lucked out and got a fantastic day weather-wise, we knew it’d get cold as soon as the sun went down! When we first entered the park around 3pm, it was very….cozy. But by the time evening rolled around, most of the people had left for the day. The Festhaus was so busy they were on a total standstill in the line, so I suggest booking your dinner time, but after dinner, there were really very few people- my boys rode Alpengheist three times in a row! Even at its busiest, we didn’t wait terribly long for rides, which is what my boys were in it for. Usually 2-3 cycles of a ride and we were in. The lights were AMAZING. Seeing them in the daylight you realize there are a lot of them, but when they start going on it’s just incredible. The lights on the Festhaus dance to music- which is just beyond. I highly recommend doing one of the “people mover” options- either the train or the sky ride- to just sit back and enjoy the lights around the park. We brought my mom with us, and she’s got some serious fear of heights, so we went with the train. 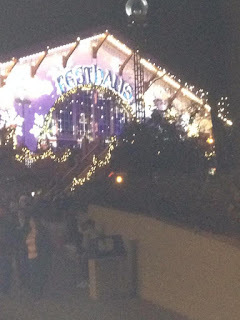 It was just amazing to see all the gorgeous lights!! On foot, one of our favorites was the bridge where they are playing “Let There Be Peace on Earth” with a light display above the water that reflects back up. It was just charming. We spent from 3pm until 10pm at the park, and we honestly did not get to do 1/2 of what we could have done. There’s so much to experience and the kids had a blast. My kids are definitely daredevils and wanted to ride everything they could. Not all of the rides are open, so they were able to focus on what they really wanted to get to. If you’re going, be sure to check out the Busch Gardens website- they’ve actually created plans for you to get around the park and focus on what’s most important to your family. Holy heck you guys, the North Pole. Looking in the large window at Santa meeting with children while the “snow” falls around you? Stop it. It’s magical and I don’t even like Santa. Most of the bloggers I’ve read recommend you go to see Santa ASAP, but honestly, even if the wait is longer I wouldn’t go until the North Pole is fully lit up because it is just incredibly breathtaking to walk around the corner into the Christmas lights and have that full experience. 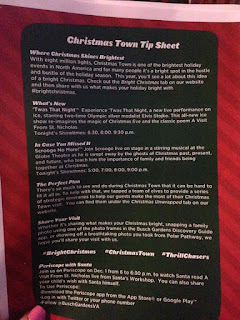 There are several shows that you can see while you’re at Christmas Town. We only got to one, and honestly, I’m pretty sure it was the one to see. Twas the Night is an on-ice spectacular based on the classic poem Twas the Night Before Christmas. The ice is small, but they use it incredibly well. My daughter was amazed by Santa “really going down the chimney!” The skaters are all talented, the costumes are beautiful- we loved everything about it. We ended our night with this show and then grabbed the last train out of New France back to the gates in England, and it was a perfect way to end our evening. 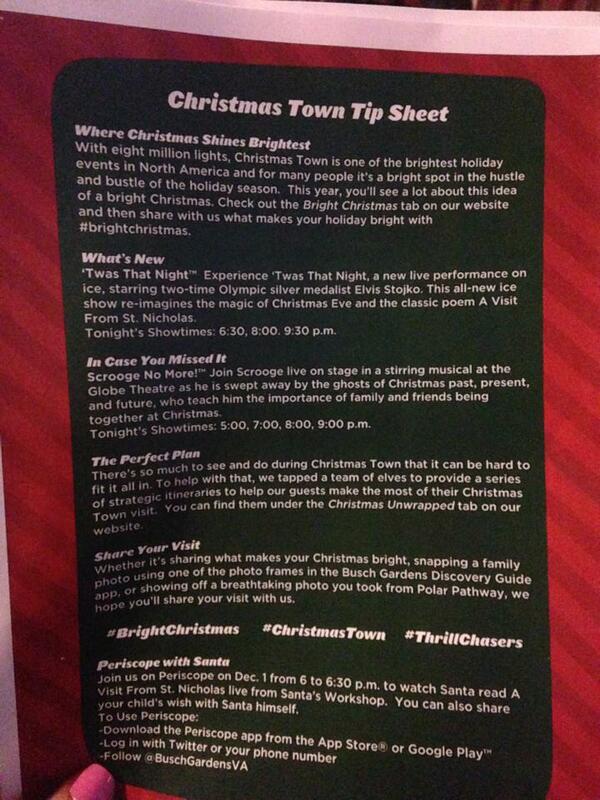 I would most definitely recommend Christmas Town. We had an amazing time and I only wish we’d had a longer day to spend at the park! I think it would be great if there were more roller coasters open for the older kids, and depending on the weather I think you could have more or less fun, but if you’re looking for a Christmas event, this is the one I’d go for. My iPhone pictures really don’t do the lights justice!